Photo: Ellsworth-Porter House, ca. 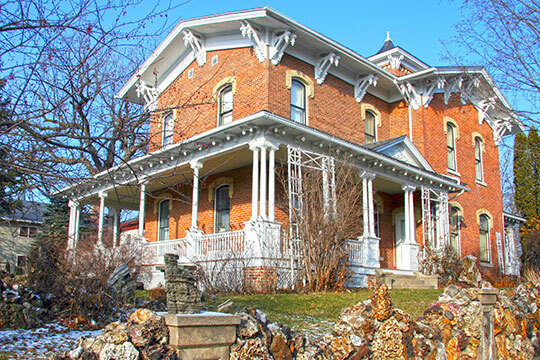 1867, 401 West Broadway Street, Decorah, IA. Listed on the National Register of Historic Places in 1975. Photographed by User:Jonathunder (own work), 2009, [cc-by-3.0 (creativecommons.org/licenses/by/3.0)], via Wikimedia Commons, accessed June, 2015. The Winneshiek County Courthouse is located at 1 West Main Street, Decorah, IA 52101; phone: 563-382-4136. The area now known as Winneshiek County was once the home of the Winnebago Indian tribe. The county is named for a celebrated chief of the tribe. Fort Atkinson was built in 1840 to provide a headquarters for government in its supervision of the Winnebago reservation. In 1842, the government appointed the Reverend D. Lowery to act as Indian Agent for the Winnebago Indian reservation. Rev. Lowery directed the building of a Mission and farm on the reservation. The "Old Mission" was located about five miles southeast of Fort Atkinson. After a treaty in 1848, the Winnebago Indians were removed from the area and the first permanent white settlers to the area arrived, initially settling near Fort Atkinson and the Old Mission. In 1849, the first settlers arrived in Decorah and Moneek and a small mill was constructed in Decorah. In 1850, the first Norwegian immigrants arrived in the area. As the population grew, Winneshiek County was formally organized in 1851 and the election of officers soon followed. The first Census of population in Winneshiek County occurred in 1850 and totaled 546 people. By 1880, the population had reached 23,938, the highest ever recorded in the county's history. The location of the county seat was contentious, with Lewiston, Moneek and Decorah as contenders. After an initial faulty election determined that Decorah should be the county seat location, residents of Freeport petitioned from 1854 to 1856 for another election to relocate the county seat. In the end, no second election was called and the county seat location remained in Decorah. (Alexander, 1882) The City of Calmar also made an attempt to secure the county seat in 1898, but that too, failed. The first courthouse was built in 1858 and housed the sheriff's residence, the jail, offices and a courtroom until 1902. The second courthouse was built in 1903 and is still in use today. New windows were installed in the 1970s and the second and third floors were renovated in 1990 and 1991. A new jail was constructed in 2000 (Winneshiek County, 2012). Over time, a few villages have disappeared, such as Lewiston, Moneek and Plymouth Rock. The towns of Decorah and West Decorah merged in 1902. County of Winneshiek, IA and Upper Explorerland Regional Planning Commission, Winneshiek County Comprehensive Smart Plan, 2012, www.winneshiekcounty.org, accessed June, 2015.